The highest point on the island of Nevis, Nevis Peak is a tree-covered, and now-dormant, volcano. Although it has not erupted since prehistoric times, there are still signs of volcanic activity in the area, including jets of steam and natural hot springs. Hiking to the peak is a popular activity for adventurous visitors. 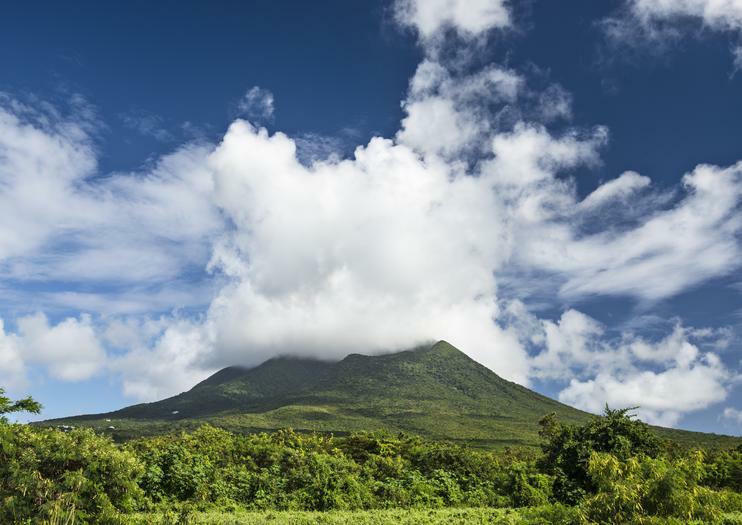 Nevis Peak measures 3,232 feet (985 meters) above sea level and is visible from almost everywhere on the island. Its steep sides were very difficult to cultivate, which means that while most of the island’s available land was used to farm sugarcane, the peak still has its indigenous flora and fauna. Both dry and humid forest cover the base of the mountain, followed by rain forest further up the slopes and cloud forest at the peak. With species including the red-necked pigeon, bridled quail-dove, and the green vervet monkey calling Nevis Peak home, it’s a haven for nature spotters. The climb up Nevis Peak is very challenging in parts—a steep, rough, and muddy ascent that makes use of ropes and rocky footholds. It is recommended that hikers only attempt the ascent with an experienced guide. Hiking here is not suitable for people with limited mobility. Hikers should bring their own water—there are no water sources on the trail—and wear suitable clothing and footwear. On a clear day, the peak has panoramic views over the other Leeward Islands. For a taste of the peak without the climb, try relaxing in the hot springs at Bath village. Nevis Peak is located in the center of Nevis in the Leeward Islands. Hiking access is usually via the trailhead next to Poor Man’s Bar in the village of Zetherlands, around a 15-minute drive outside of the capital, Charlestown. The hot springs are located in Bath, just south of Charlestown. It is best to attempt a climb during the drier winter months (December to April), as trails can become very muddy after heavy rain. St. Kitts and Nevis is one nation made up of two neighboring islands, and many visitors spend time in each location. For a truly unique way to see St. Kitts, book a trip aboard the Sugar Train, a narrow-gauge railway that was once used to transport sugar cane around the island. Nowadays, the train has been transformed into a comfortable tourist attraction with glasses of rum punch served as you go.